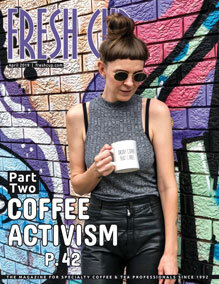 I spent a couple years in Phoenix, Arizona, becoming acquainted with specialty coffee and the community that comes along with it. Phoenix is a growing city where creatives have a place to contribute to the culture and receive support. In these shops I found friendship and hospitality and began to shape my place in the industry. PAREDES: Crêpe Bar was one of my first experiences, not only in specialty coffee and food, but in finding camaraderie. 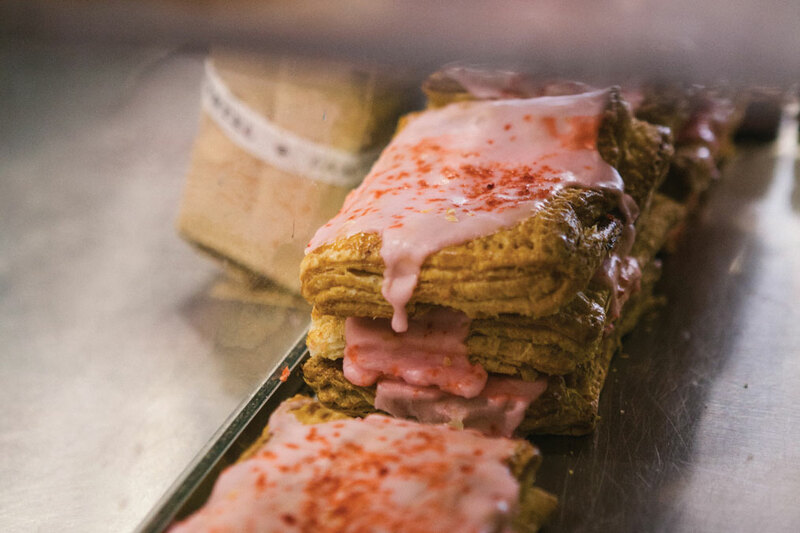 Chef and owner Jeff Kraus’s original concept for Crêpe Bar was a culinary-focused food cart, which went brick-and-mortar in 2012 to create a fast-casual restaurant with a higher standard for friendly service and attention to detail. As part of this transformation the coffee bar was added, designed by local barista legend Jason Calhoon. 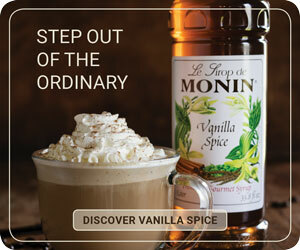 This made Crêpe Bar the city’s only café specializing in both coffee and food. 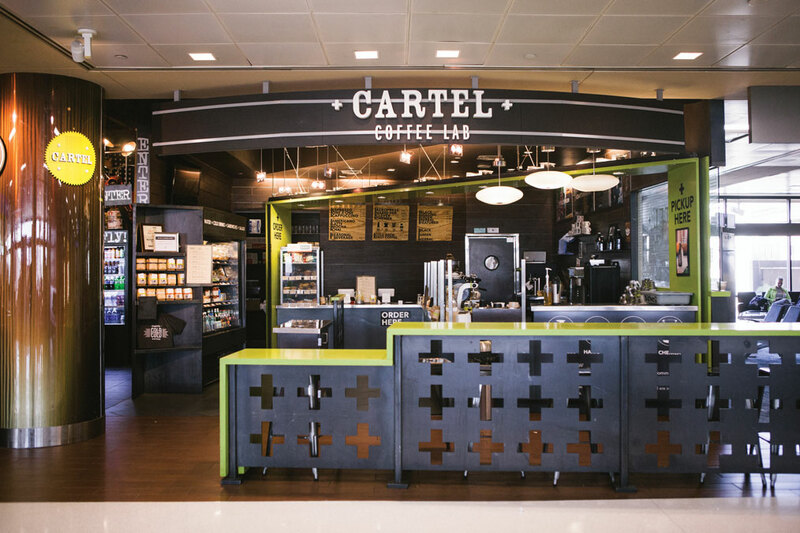 PAREDES: Cartel had long been one of my favorite places to drink a cappuccino and meet people, so I was excited to join the company as a barista at their location at the Phoenix Sky Harbor International Airport (Terminal 4). The shop became a piece of home to me. 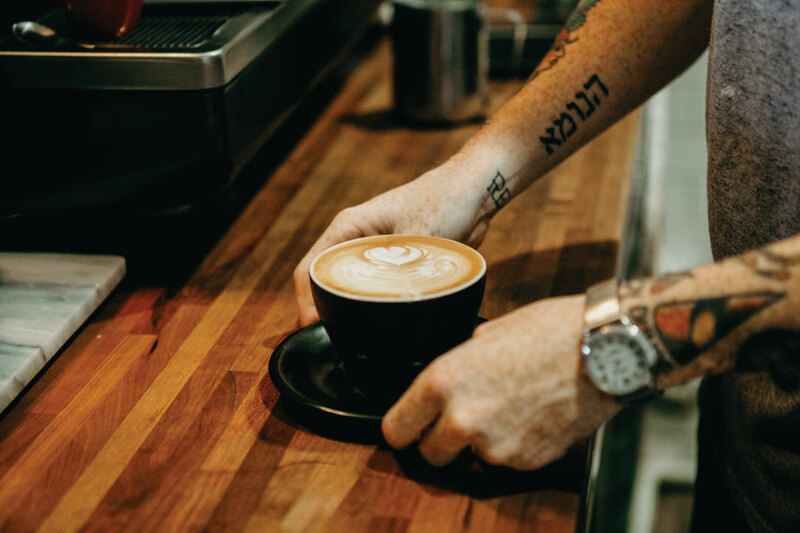 Working here, we often heard from customers that they planned their layover in Phoenix so they could stop by for specialty coffee during their travels. What started as a trip to a specialty coffee farm in Huehuetenango, Guatemala, in 2007, became the concept of Cartel Coffee Lab: a place to bring quality beverages to Arizona. Co-owners Jason and Amy Silberschlag, and roaster Paul Haworth followed with a trip to Southern California to purchase a used roaster and deliver it to the flagship Tempe location, where it still abides. The Silberschlags were both experienced baristas and in 2009, Jason placed second in the Southwest Regional Barista Championship. 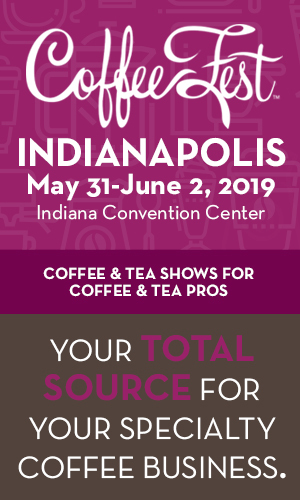 The vision for Cartel grew: to establish the company’s place on the national specialty coffee map, and to become a trusted source for high-quality roasted coffee. Cartel now operates six locations in Arizona. The Phoenix Airport shop opened in 2012, marking one of the first independently owned specialty shops in an airport. The shop only opened after agreeing it would be staffed by their own baristas, and not by a third party agency. 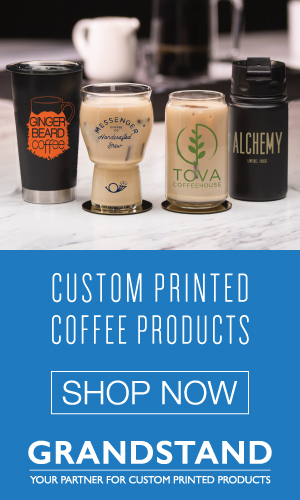 Like all their locations, the store offers customers an espresso, tea, and filter coffee menu (fueled by a Fetco batch brewer and backed by a slow bar comprised of Aeropress, V60, and Chemex). From the planning stages of Cartel through today, the partnerships with specialty coffee farms are highlighted in Cartel’s direct-from-source offerings: beans sourced from friendships built over meals shared with farmers in Central and South America. PAREDES: Futuro opened in 2016, toward the end of my time as a Phoenician. It was where I’d run into friends, or a local barista grabbing coffee on their day off. My beverage of choice was their espresso tonic. William Kennedy is a barista at Futuro. Cascara con Topo Chico, anyone? Futuro sits inside a creative space known as Palabra in the Phoenix Roosevelt Art District, which houses a salon and art gallery in addition to the coffee bar. The gallery showcases a rotation of art from local artists; the space itself is the collective genius of Chuckie Duff, local architect Artie Vigil, and lead contractor Rob Withem. 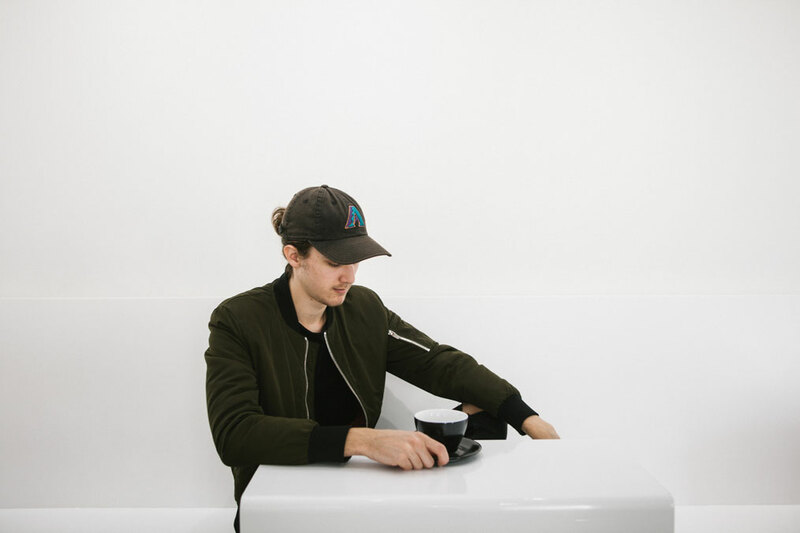 Jenson Metcalf is a barista at Cartel Coffee Lab and a customer at Futuro. Torres collaborated with Harlin Glovacki and William Kennedy for equipment selection, including a La Marzocco Linea 2, Mahlkönig K30, and Mahlkönig EK 43. 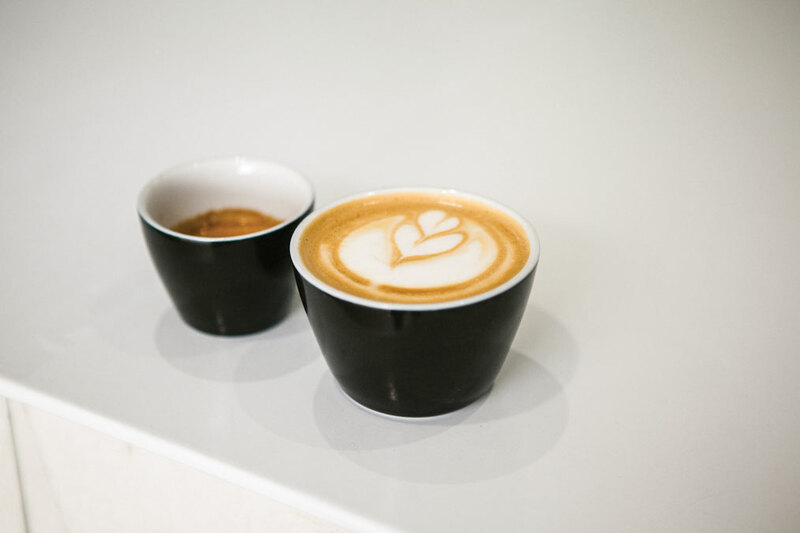 The bar features coffee from Vancouver, British Columbia’s 49th Parallel, in a drink menu presented in Spanish—a small detail where Torres can show respect to his culture and mother. The whole space is meant to be an experience: from the architecture, to the coffee and art, to the weekly curated music playlist. Torres carefully selected every detail, down to the milk and ceramics, the artisan toast by Heft Co.— topped with preserves from Sqirl—and the pastries from leDinersaur. Each detail is meant to complement another. Provision’s Lawrence Jarvey prepares a signature drink. 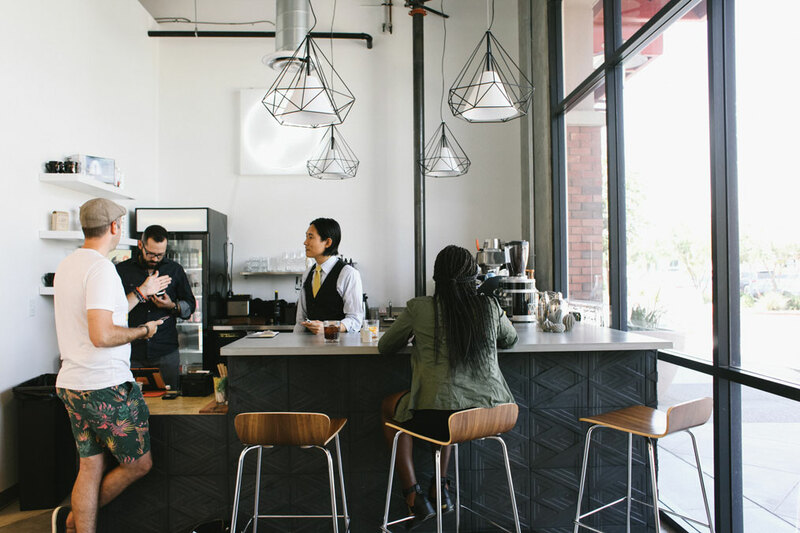 PAREDES: Set in the east valley of Phoenix, Provision offers specialty coffee where it’s hard to find, and was always the most inviting and welcoming space when I’d stop in craving a honey lavender latte. 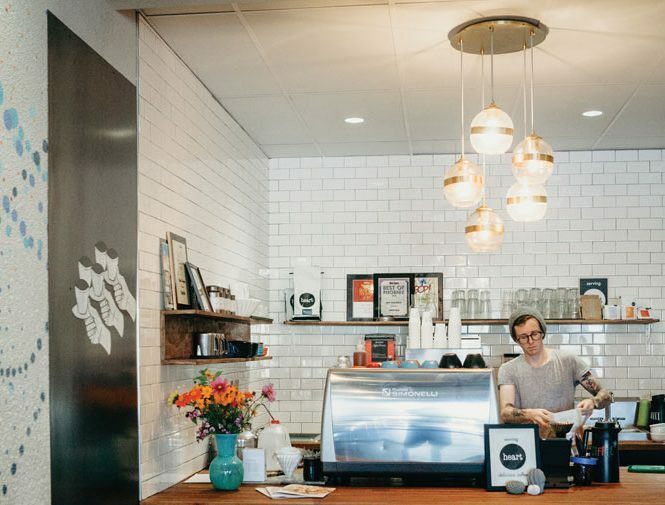 Owners Lawrence Jarvey and Daniel Suh began Provision Coffee five years ago as a wholesale coffee roaster, focused on the goal of building community through quality coffee. The company prioritizes on long-term relationships with coffee brokers and farmers, built by traveling to origin where Jarvey and Suh aim to understand the farmers and their communities. 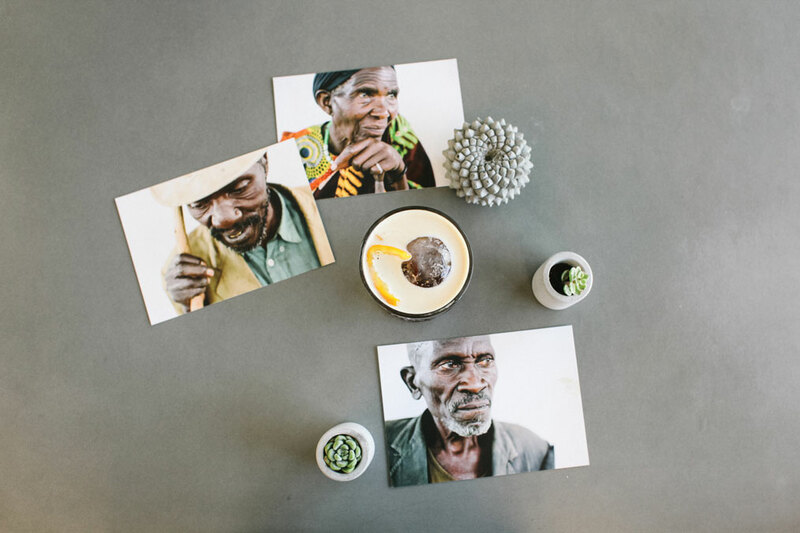 Provision makes these relationships personal, so they can better address specific needs, such as cows for the farmers in Burundi, and scholarships for the children of their farmers in Guatemala. As roasters, the team at Provision develops their roasts just enough to highlight the notes of chocolate that balance the beans’ natural fruit acidity. Lawrency Jarvey (left) and Daniel Suh (right) mingle with patrons from behind the bar. 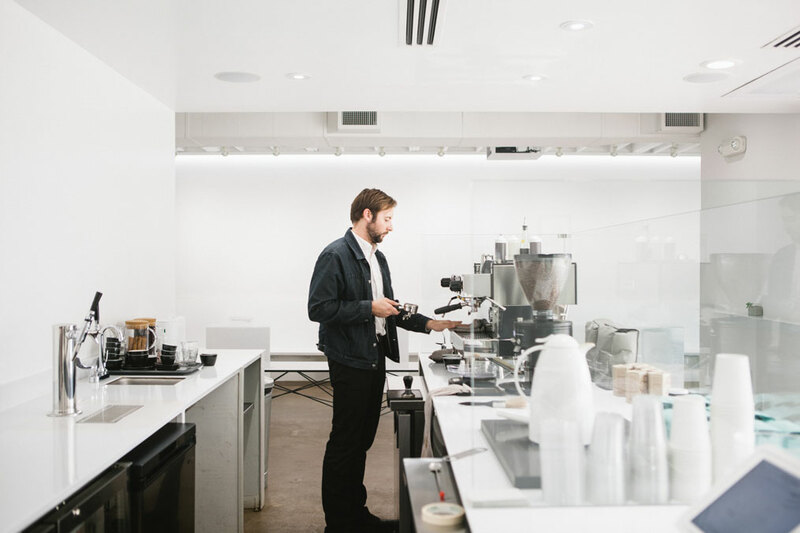 The bar is staffed by baristas who complete an extensive training program based on SCA standards, using top-quality equipment, such as a La Marzocco GS3 (soon to be upgraded to a two-group Linea Classic AV), alongside a Mahlkönig Guatemala and K30 grinders, and a Baratza Vario-W grinder for a Curtis Gold Cup brewer. 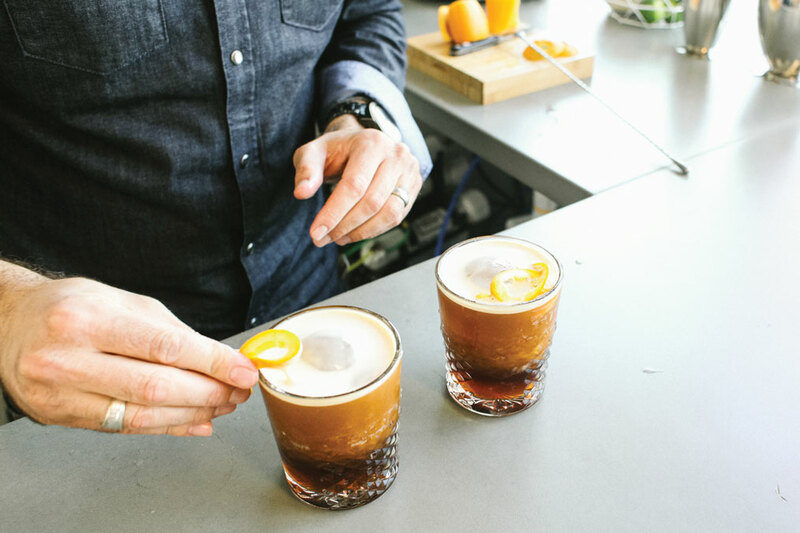 On the menu, accompanying traditional coffee beverages, you’ll find signature coffee drinks inspired by classic cocktail recipes, including aromatic bitters and garnishes, and both nitro cold-brew coffee and sparkling white tea on tap. Food offerings include pastries from local bakery Pistol Whipped, with a full menu of artisanal toasts using Noble bread. —Cheyanne Paredes is a freelance writer and photographer based in Portland, Oregon.